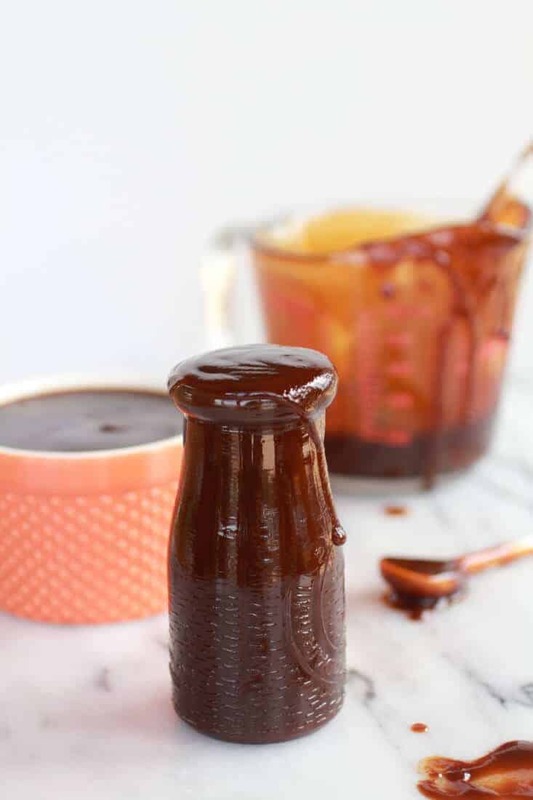 Homemade Barbecue Sauce……Just like Sweet Baby Ray’s! 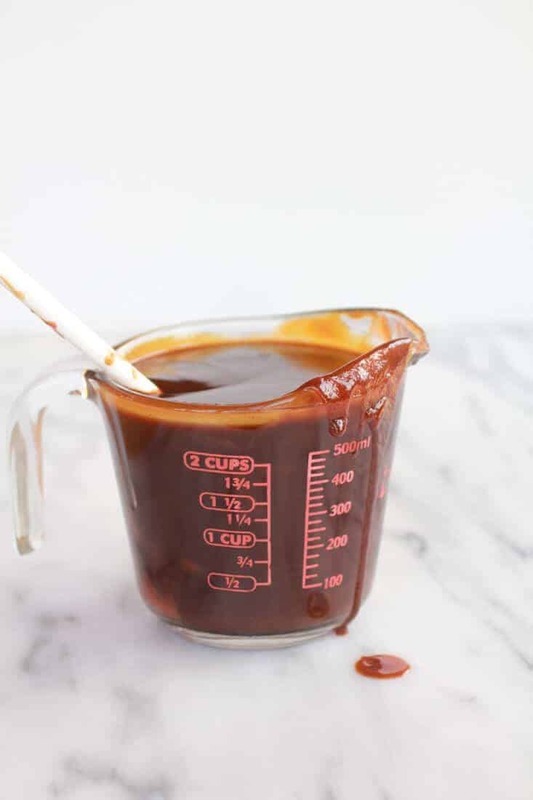 This Homemade Barbecue Sauce……it’s just like Sweet Baby Ray’s and it totally has me wishful thinking…Come on. We were almost there, we even had some nice warm sunny days. I could feel spring! But then, yeah you guessed it. It totally snowed last night. I am not going back to my winter ways. I am rebelling against this weather! It is April gosh darn it! Technically I know April is a little early to be breaking out the grill, but let’s just say I am getting you guys ready for that hot spring day when you decide it is time to break out the grill. Before you know April will be over, mid May will hit and with it will come (hopefully) warm temps! Or maybe you are lucky enough to be in one of those spots where the warm weather has already arrived…lucky you. Really is there a better way to prepare for outdoor cooking than homemade BBQ sauce! It’s pretty much any griller’s favorite sauce. Heck whether you are griller, broiler, Gorge Foreman lover or baker, it is still probably your favorite sauce. Over here we grill all year round. The boys CANNOT live without their grilled chicken or steak and my dad only likes his fish grilled. Not seared, not baked and not fried. Grilled. So our grill gets a whole lot of use. Therefore, we also go through a whole lot of BBQ sauce. Obviously. Hands down, around here the family favorite is Sweet Baby Ray’s. The problem? It is filled to the brim with high fructose corn syrup! Barf. So I made my own. And oh fudge it is good! And like ridiculously easy. It takes me ten minutes to throw together! Yes, just 10 minutes! You definitely can’t get to the store and back in 10 minutes! Plus, my guess is you have every single ingredient in your kitchen right now. Honestly, it could not be simpler and it could not taste better. Even the texture is stop on. Sweet Baby Ray himself would not be able to tell the difference. Yeah, I am serious. It is that good. Combine all the ingredients size sauce pot. Bring to a boil and reduce and simmer for five minutes or until all the sugar has dissolved. Serve immediately or cover and store in fridge. Bone suckin’, lick the spoon (jar, bowl, table, whatever), good! 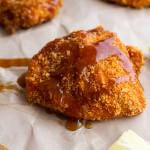 Oven-Fried Southern Chicken With Sweet Honey Bourbon Sauce. Need to try this. Baby Rays has the best taste of any sauce I have ever used. I agree! This sauce is better, so easy and SO much cheaper! I just made the BBQ sauce. It is very good, but I will use less cayenne pepper next time. My mouth is still burning. HAHAHA!!! I had some left over grilled chicken so I cut it up and put the sauce on it. Made me a BBQ chicken sandwich on a whole wheat bun. My husband will probably like it that hot. Also, I used sucanat instead of the brown sugar. I did not use the corn starch either. It was fine without it. Yeah, the cayenne is hot! My family likes the heat, sorry about that! But I am glad you liked it! Thank for letting me know! I love SBR’s sauce, but when I saw that the first ingredient on the label is high fructose corn syrup, I immediately went to look up a copycat recipe that would be a little bit healthier. Thanks for sharing, and I can’t wait to try it this weekend!! It is a very subtle flavor, but if you do not have it on hand than yes. Hope you love this! Thank you Thank you! That is our favorite as well but I also worried about the “sugar” content. I will definitely be making this. I hate al the sugar, which is why I made my own! I hope you love this! At least a week, but more like a month or longer. Hope you love this sauce! Thank you so much… i’ve been looking for a good homemade sauce (ie, without all the HFCS!). i love your blog and love the fact that you’re following a passion at such a “springtime” age. go you!! Ah, Thank you!! This is the nicest comment! It totally keeps me going! You are so lucky! It is snowing like crazy here and it is not going to stop! Thanks for reading Dorothy! I LOVE Sweet Baby Rays! Pinned! I never had Sweet Baby Rays, but this looks wonderful. I need this for ribs. Thank you for sharing. I needed a good recipe for BBQ sauce. I hope it’s as good as it looks. Pinned! Never had Sweet BAby rays! Wow, you have to try this then! I love Sweet Baby Rays! Thanks for sharing! I Must try this! Stop over and say hi, hopping by from Melt in your Mouth Mondays! Thanks Krista! This is so much better than the store bought stuff! The pineapple juice is delish in this! This looks delish! I love Sweet Baby Ray’s so will definitely be trying this!! I would love for you to come and share at our link party! Oh this looks so tasty! I love BBQ!!! Thanks for sharing on Show Me Your Plaid Monday’s!!! BBQ Sauce is so good! Thanks so much! My mouth is watering for some BBQ straight off the grill! Definitely giving this recipe a try! Thanks so much for sharing at Time to Sparkle Tuesday! Let me know if you try it and thanks again for reading Liz! The grill is the best and this sauce is SO good! Let me know if you use it! Thanks so much for reading! This recipe is awesome! I can’t eat Sweet Baby Rays because it has high fructose corn syrup… so this is perfect 🙂 Thank you!! I hate the high fructose corn syrup! Why eat it when you dont have to? This sauce is better anyway! I really love the idea of making my own BBQ sauce. I have not done it in years. The fam. has been bugging me to make ribs, I think this sauce would be perfect! Thank you for sharing. This sauce is perfect for ribs!! I hope you guys love it! I pinned! Can’t wait to try. It is very similar to the one I make, but I have never tried the pineapple juice…Thanks for sharing! at the Love Bakes Good Cakes Linky party! Thank you and let me know if you give it a try! Oooh, this looks delicious! Sweet Baby Ray’s is one of my fave bottled sauces, but I’m all about making it homemade instead. Thanks! Thank you and Homemade is always better!! I was just talking to someone about making homemade bbq, and I found your delicious recipe! I will be sharing this with all my friends! Thank you ! Thank you!! I hope you guys love it! The presentation of this sauce says everything…looks delicious! Thanks for sharing, came over the Shabby Creek Cottage party! am SO ready for SUMMER! Thanks for pinning! Thank you, let me know if you try it! 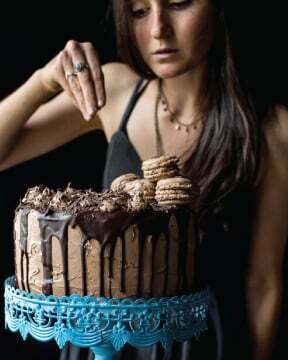 I will let you know when I make this! Yum!! Please stop by and link up at my link party, “Pin it Again” Friday, if you have some time. It is live now and waiting for your lovely BBQ Sauce! Blessings! I will have to make this the next time we fire-up the grill. Pinning now! Stopping by from Thirty Homemade Days! Let me know if you make this! I hope you love the sauce! mmmmmmmm…..My family Fav too! Pinned ~ thanks so much for sharing at the 30 Days Pity Party! Sweet baby rays is the best! Thanks for pinning! We go through quite a bit of barbecue sauce here too! 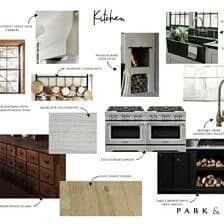 I love the idea of making your own! Love the pics girl!!! BBQ sauce is a must over here!!! Hi! 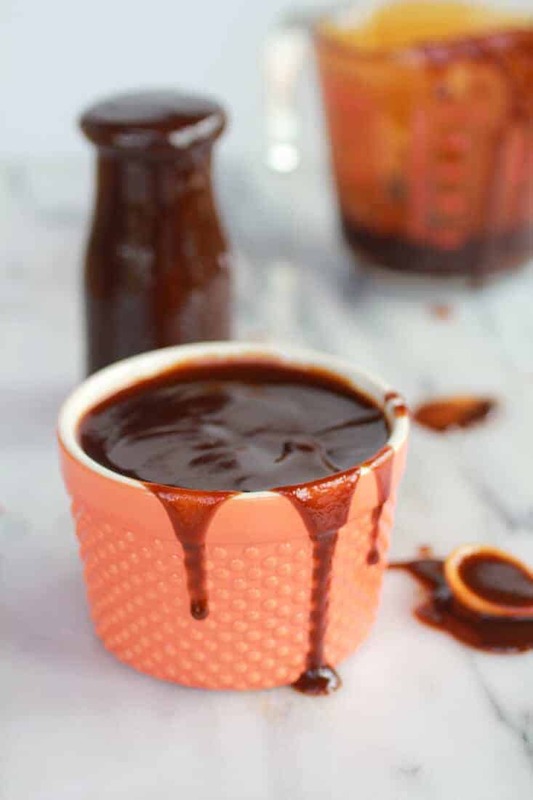 Your recipe looks delicious, I’ve never made my own barbeque sauce but always wanted to try! If I made it do you know how long it would keep in the fridge for? I dont know exactly how long but at least a few months. There is really no reason why it would go bad, but I can not say for sure! I hope you love it!! Thank so much for the feature! Yum! Can’t wait to try this! I love that I can make it without HFCS too! Yeah! I’d love to have you link this to Titus 2 Tuesday this week on Cornerstone Confessions.. I hope to see you there. YUM!! Let me know what you think! Looking forward to trying this. We try to avoid HFCS too and my hubby adores Sweet Baby Rays. Thanks! I hope you love this!! Thanks for reading! Sweet Baby Rays is my absolute favorite BBQ sauce, will try this soon! Ya! Let me know when you do! This absolutely IS Sweet Baby Ray’s sauce! Once I saw the pineapple juice in your ingredients list, I knew this had to THE recipe! My husband won’t eat any other BBQ sauce except for Sweet Baby Ray’s so I have really had my work cut out for me trying to find a sauce that would compare. 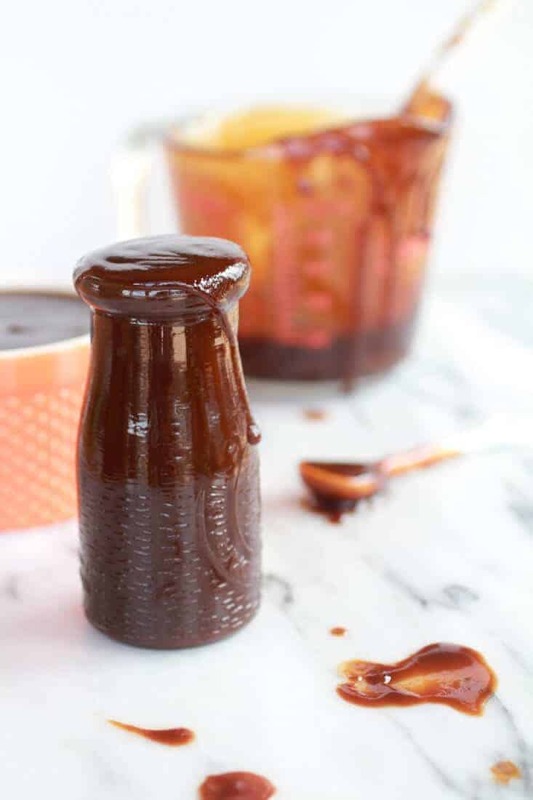 This sauce he loved and said it could replace the bottled stuff…FINALLY! OMG YES!!! This is awesome! I am so glad it past his test!! This excites me greatly! WOW I can’t wait to try this! I just want to dip some fries in that BBQ sauce, yum! I’ll be featuring you tomorrow at Show & Share Wednesday. See you there! Thanks Kelly and thank so much for featuring me tonight! Sweet Baby Ray’s is my family’s favorite! Definitely trying this. Clicked over from Shabby Creek Cottage and I hope you don’t mind that I pinned your recipe. Thank you and thank you so much for pinning! Thank you Ruthie! I am so glad you like my photos! Visiting from Weekend Wrap up! My boys love Sweet Baby Ray’s but I also refuse to buy it with the junk that’s in it. Thanks for sharing! Come check me out when you have a minute. I hope your boys love this! Sweet Baby Jesus. I should’ve read the comment first. That sauce is hot! But it is so delicious, which makes it twice as dangerous, haha. Ha! i did not realize it was so hot!! Geez, I am sorry! Glad you still like it though! What a fun recipe! We’d love for you to link it up with our Wednesday link party. Ha! Thank you!! I hope you LOVE this! Wow, that looks amazing! I love your gorgeous photographs as well. I am just curious how long it lasts in the fridge? I wonder if one could can this for future use? Maybe leave out the cornstarch and add a bit more liquid? I think that sounds like a great idea!! Let me know how it gos! haha! Thank you, Sherry! Hope you love this as much as we do! This sounds really good. I’d probably add just a touch of liquid smoke, just a tiny bit because it takes over fast. Sounds good! Thank you, Kathy! I have personally never done it, but I see no reason why it can not be canned. Hope you love this! I still have not tried canning this. Sorry! This is so good! Thanks so much for sharing your recipe! I’m making a second batch now! Of course! Thank you for making it! So happy you love the sauce! what do you recommend storing this in?? Anything you have would be fine. A bowl, a glass or plastic storage container or if you have them I really like using a ball or canning jar. Hope this helps and I hope you love the BBQ sauce! I only use Sweet Baby Ray’s BBQ sauce and I cook on my grill about 5 times a week, next month I have to cook 50 briskets for a party, this recipe will come in handy !!!!! I forgot to mention that I will need to make about 5 to 10 gallons of sauce, not 2 ½ cups so I will have to do some math and experiment. Haha! Glad you love this sauce! Oh wow!! That is a lot of briskets! Hope the sauce works great! Tieghan, I’m from Sydney Australia and just found a rib recipe that uses Sweet Baby Rays. Never heard of it before but going to look tomorrow. If I can’t find the original, I’ll try your version but would be nice to compare. From the other blogs, yours sounds better. Shall let you know in 2 days time. The strange thing is that the recipe I found adds 2 tsp Worcestershire & 1 tsp vinegar to the Sweet Baby Rays. Hardly seems worth it since your recipe already has those. Thank you so much for your research. I hope mine is a winner for you!! Can’t wait to hear! Tieghan, WOW!!! I couldn’t find the original SBRays so I cooked your version. WOW!!! Admittedly I added some chilli flakes as I like it HOT and it was perfect. The mix of sweet and hot was incredible. You should market it as Sweeter Baby Tiegs Rib Sauce. You’d make a fortune. Thank you SO much. Yeah!! OS happy you loved you and thanks for trying it! I’ve never made my own BBQ sauce before. I will NEVER buy sauce at the store again!! I could seriously eat this by itself (or at least clean out the pan that it was cooked in). Didn’t have any smoked paprika, so I had to sub regular paprika and 1/2 tsp liquid smoke. Left out the cayenne completely cause I’m not a “hot” person. It was perfect for us. Thank you so much!! YES!! It is so goo isn’t? So happy you guys liked this!! I didn’t make the full quantity, I only had two small racks of ribs but used the same ingredients and it was amazingly good. My daughter who is the BBQ sauce lover in the family has ordered me to never buy bottled BBQ sauce again. Going to make the full recipe and bottle it. Thank you from down under. Yay! I am thrilled you LOVED it!! Really good BBQ sauce. It doesn’t taste anything like Sweet Baby Rays but it is a sweet and delicious sauce. Thanks so much, Ashlie! Glad you liked it! Oh yeah! SO happy you love this! It is totally spoon worthy! Thanks so much! I am really fond of BBQ recipe. For that reason I need BBQ sauce. 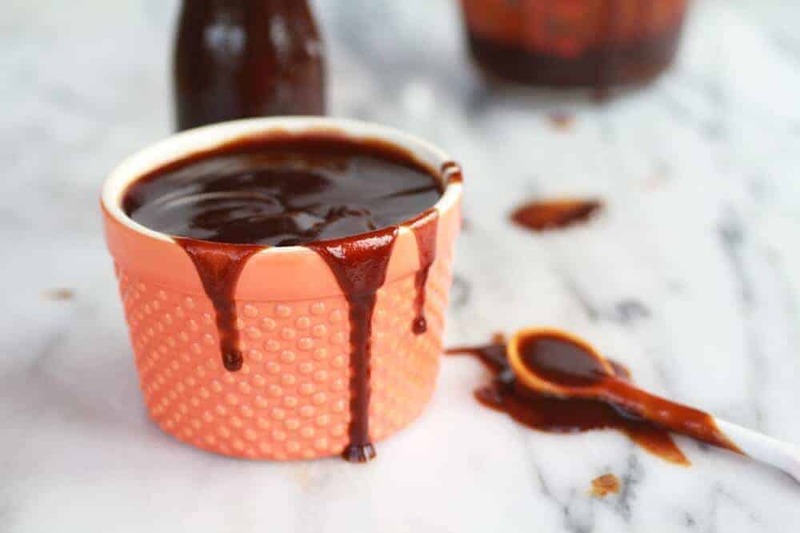 This BBQ sauce recipe really superb and I think it’s cheaper also. I will do it at my home. Great sauce recipe! I added a 1/4 cup of local honey to mine. Once cooled I fluffed it up in the blender. Thanks Scott!! That honey sounds awesome! How long does this barbeque stay fresh for? Hey Julie!! I would say up to two weeks, but honestly probably a lot longer! Two weeks is being safe! Hands down my favorite BBQ sauce (my family’s too!) I omitted the cayenne and I didn’t see the point of adding water only to add corn starch to thicken it, so I left out ALL water and cornstarch. Consistency is fantastic! Thank you for this! I’ve never tried Sweet Baby Ray’s sauce but I loved yours soooo much that I even won’t search for it 😀 So easy and so delicious. This sauce is fantastic! We love Sweet Baby Ray’s but this is so much better and I’m glad to ditch the HFCS. How long will this keep in the fridge? Nevermind… just saw the answer above. Somehow I had missed it when reading the comments. YAY!! So happy you loved this!! It is a family favorite!! LOVE Sweet Baby Ray’s..but hate HFCS…thanks so much for the recipe. I’m trying to cut back on sugar and was wondering if I could use Stevia instead of sugar…What do you think? I have never used stevia, so I do not really know how it would turn out. 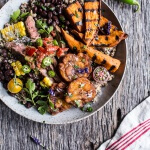 I would think that if you like it than you would probably like the stevia in this recipe too! Let me know how it goes! But the label says there’s tamarind in it and there is none in this recipe. This sauce recipe is a ringer match for SBR. I used vinegar instead of pineapple juice and also Frank’s Red Hot instead of cayenne powder. I was so interested in this recipe that I doubled it. Something I do that is not covered in any BBQ sauce recipe guide is the use of my slow cooker. Steady heat all round and no scorching. I cook on simmer(180 degrees) for 1 Hour and 15 minutes. It thickens beautifully. The secret to this recipe is the smoked paprika instead of liquid smoke. 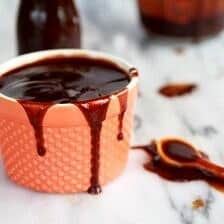 After experimenting with countless recipes, I know that I’m done looking for the best homemade sauce. You can put this stuff on a doughnut! Awesome!! So happy you love it! Great BBQ sauce was looking for sauce to complete my side rib meal and this made them the hit of the night. This recipe is a real treasure. Thanks for sharing. So happy you liked this!! Thanks! I was wondering if you know if this recipe can be canned? Just made this today! It tastes so good! I used regular paprika and next time I’ll only use 1/8 tsp cayenne pepper! Didn’t need the cornstarch. So happy you loved this!! Thanks Teresa!! 1/8 cold water? 1/8 what? Thanks. Sorry about that! Hope you love this! Thanks! I think the question is how much water? So happy you love this. Thanks!! This bbq sauce sounds amazing! I have never tried canning this, but I do not see why not. Please let me know how it goes. Thanks! Is it compulsory to spill it all over the place ? And it’s Worcestershire sauce but the shire part of the word is never pronounced. So happy you love it, thanks! i have successfully canned this sauce and trust me, its delicious when i cook with it. I love the fact that I can go and grab a jar of this when I go to my pantry. Ya! I am so happy to hear! Thanks Crysta! I’m so excited to find this recipe! Thanks for working it out and posting it. I will be making it this weekend for some meaty pork ribs for the last barbecue of summer. Everyone says Sweet Baby Ray’s is the best, but like most people, I can do without the HFC! Hope you love this! Thanks! I’ve made this sauce twice in a week since I’ve found this. 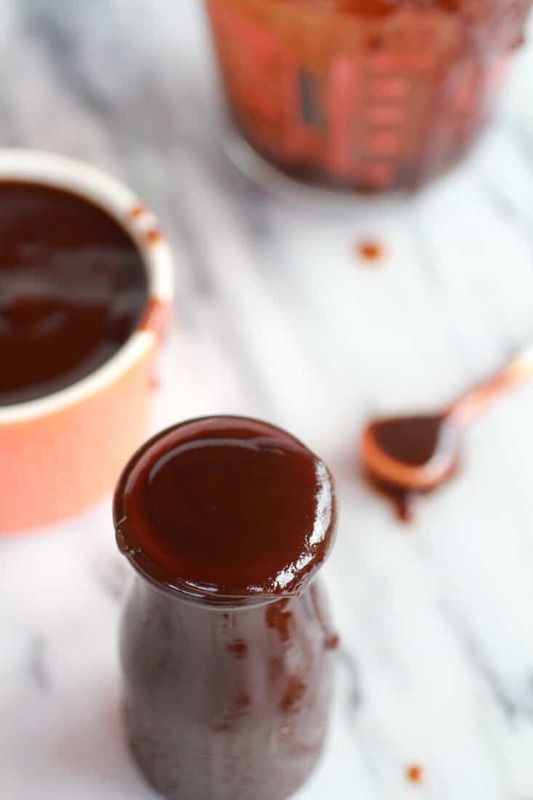 This is an amazing BBQ sauce and my husband loves it! We live in Japan and can’t find his favorite sweet baby rays BBQ sauce at the local stores, and this was a lifesaver. Thank you for sharing! Thank you for the recipe! It was delicious for our pulled pork. I reduced the sugar by a 1/4 c and left out the cayenne pepper to make more kid friendly I loved the molasses flavor in it. Everyone thought it was amazing. We will definitely make this again. I have now made this at least 6 times. This is the only BBQ sauce we eat now. Thank You!! 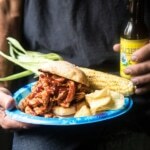 Made this today to use in your BBQ beer pulled chicken recipe. Oh boy is it delicious! Thank you! Idont haveeeee molassses one hand. Do I need it or is there a substitute I can use. Hey Sherry, the molasses is kind of important. Is it possible to get some? can this be made in a big batch and canned into canning jars to put on shelf. should it be water bathed or pressure canned, how long? Hi Susan! I have never canned this so honestly I really cannot say. SORRY! Hi, im so interested with your recipe but I cant find molasses here in our place. is there any substitute? Come on there is no substitute for molasses. But I’m sure you can find it if you look a little harder. If all else fails try god forbid Walmart. HI! Maybe just try leaving it out. I still think the BBQ sauce with be fine. Hope you love it! I can’t believe I’m the first to ask, just read all the comments looking for a question about the Worcestershire sauce. My son is allergic to wheat which is an ingredient in that sauce…any suggestions on a substitute? Thanks, can’t wait to try it! Just leave it out. No big deal. Hope you love the sauce! Can you make a few batches of this and freeze it? Thank you for your help. Hi! I think that would work great, enjoy!! Love your sauce. I was going to grill some chicken but noticed that I was out of sauce. Found your recipe I will NEVER buy sauce again. I is so easy to make. THANK YOU! So happy you love it! I have to get some ribs and use this sauce on the smoker it is A WINNER… Thanks so much for posting this………. Ya! That is awesome! THANKS! I came across this recipe while prepping for a church cook-out. I like Sweet Baby Rays, but like my BBQ a little sweeter. I followed the recipe, with the only exceptions being no water-cornstarch mixture, a pinch of Cayenne Pepper, and I added a 1/4 cup of Honey on top of everything else! My family loved it, my daughter even said it should be called Sassy Sauce! SO happy you all loved it, thanks! I love the sugar! Not one thing wrong with it in moderation. I highly doubt anyone here will consume the entire recipe worth of surgar at any one time. I wish people would keep that nonsense to themselves and do what they want without bragging to the world that they are just sheep on the kook bandwagon. Let me guess, you all shop at trader Joe’s or whole foods right? I am shocked that it was not announced/broadcast here to show everyone just how obsessed with fads you are. I’ll continue my moderation and enjoy life as that is the key, not this obsessive compulsion. I made a few alterations to this wonderful, delicious recipe. I quadrupled the ingredients adding extra garlic powder and paprika. Instead of cayenne pepper, I minced about 10 habanero peppers (mine weren’t that hot this year) and also added additional corn starch. I put the bbq in canning jars and gave them a 10 minute hot bath. I’m going to see how long this will keep. Of course, I did try it before canning and it was fantastic!!! Thanks for the recipe! America’s Test Kitchen recently tested BBQ sauces and Bull’s Eye tested number one. Since I last commented, yours is the only sauce I make. But of course, you run out of homemade from time to time. So I bought a bottle of Bull’s Eye and tried it. It has the same flavor profile as SBR with a more pronounced vinegar note. So, on my most recent batch I doubled the vinegar from 4 to 8 oz. and a perfect match. Two nationally known sauces with one adjustment. RE: My first post said that I doubled the recipe, hence 8 oz. vs 4 oz. OMG!! Thank you for this recipe! I made it today, and it is fabulous! I made a couple of substitutions. I was out of garlic powder, so I used minced garlic. I didn’t have molasses, so I used honey. My husband and I LOVE it! Next time I will make it even spicier because we really love the heat. It was so quick and easy. This is a winner! Your forgetting the tamarind paste! I personally love “honeyBBQ” more than reg bbq, any ideas how I can adapt it n quantity? It was hard to get the melasse in holland, but have to say. WAUW, that is a fantastic sauce… Never tested sweet baby rays, but this is the best sause I ever had. So happy to find this recipe. I love SBR sauce but the HFCS is a turnoff. I’ll be making this today to go with some BBQ wings I’m making. Thanks? What a simple and quick recipe. How long does it keep? Thank you! At least a month in the fridge. Yummy. I made this and then hand my husband do a taste test between this and the original Sweet Baby Rays. Color is spot on. The only real taste difference is the flavor of smoke in the original Sweet Baby Rays and if you make this with pineapple the taste is sweeter ( maybe 1/2 pineapple juice and 1/2 apple cider vinegar next time) I added about a 1/2 teaspoon of smoke and about 1/4 teaspoon cumin. So good. Thanks for a really good recipe. Neat…good to but recommend mire ACV and pineapple crush blended and some juice. Black, White and Red pepper…..What no liquid smoke? Just made this tonight and it was amazing!! I used apple cider vinegar and regular paprika, then added a small splash of liquid smoke. I didn’t add the water/corn starch mix because I put it in the slow cooker with shredded beef. Yummy!! I’ll be using this recipe for much more dishes in the future!! Any way to decrease the amount of brown sugar? Or sub w/ part honey? HI !Yes, You can decrease the sugar by half, but it will not be as sweet as a store bought BBQ sauce. You can also use all honey or half honey and half sugar. Just taste the sauce and add more sugar to your taste. But I think honey will be delicious! Let me know if you have any other questions, thanks! Love this sauce. I make it using the Heinz ketchup with no HFCS and it’s awesome. Just made a triple batch getting ready for a big BBQ this weekend! YAY So happy you like it!! This is a great recipe because I like Sweet Baby Ray but hate HFCS! Thanks for sharing! I did not add cornstarch and I used apple cider. Next time I will try with the pineapple juice. This was so easy to make and I had all the ingredients in my pantry and refrigerator. Beats the store bought BBQ everyday! Wow-so glad. I came across this. Can’t wait to get back to Kansas City and try this. We are in Chicago area and planning to eat at Sweet Baby’s Restaurant tonight. I can compare but obviously will not mention this to them. Thanks so much for the great recipe. Thats SO Awesome!! Please let me know what you think of the comparison!! Hope you love both!! All ketchup has sugar and/or HFCS so using ketchup as a base is not any healthier than the ready made bbq sauces. I start with tomato sauce and build the flavors using honey and brown sugar for the sweetness. The spice list is pretty spot on for any bbq sauce – I also add cumin for a little extra smokiness. 1/8 gallon, cup, teaspoon,,, 1/8 what of cold water? I just found your recipe today. 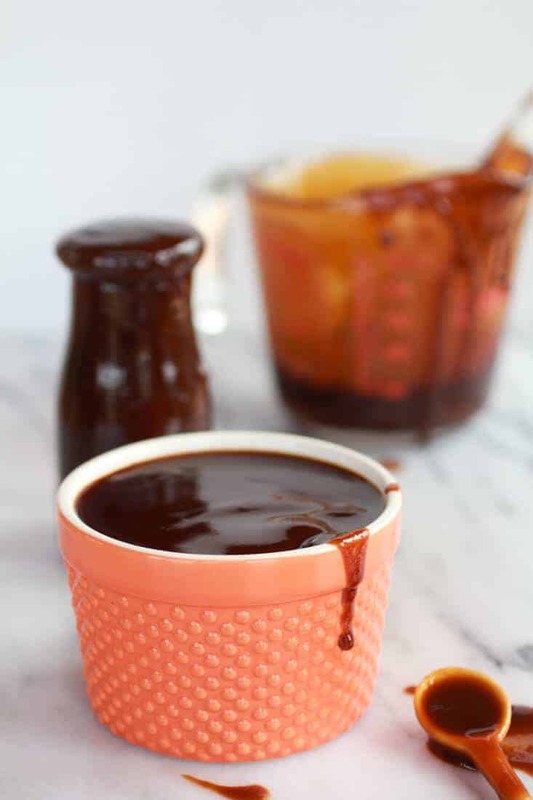 After years of experimenting with different BBQ sauce recipes, my family all agreed….this is IT! SO good. Followed the recipe exactly as written (subbed cider vinegar as recommended because that’s what I had on hand). Thank you! WOW! What a compliment! Thank you so much Michele! So happy you all liked it! Barbeque sauce is probably one of the best uses for high fructose corn syrup, IMHO. I realize it’s not the “PC healthy choice” but I don’t get why people are so worried about bbq sauce they might eat 4 or 5 times a year having a little high fructose corn syrup in it…!? What’s the deal, are you eating it straight like soup or something? Your just supposed to put a little on your meat, not a ladle full per plate! You do want to taste the meat, right? The sauce recipe looks delicious BTW. Cheers…. Thanks Mark!! I put mine on meats. This looks amazing! How long do you think it will last in the fridge? Hi Christie! Thank you! It’s keep at least 1 month. I am from Belgium and been looking for the best American BBQ Sauce since my trip to CO.
Hey Thomas! These swaps will work great! Either salt option should be fine, just make sure to adjust the salt level to your taste. Let me know if you have any questions. Hope you love the BBQ sauce! Thanks! I am not a fan of BBQ sauce but I needed some as I currently have a brisket in the oven. Well I just made this recipe and OMG, it is amazing!! YAY!! So happy you love it!! Thanks Melissa! I was scouring pinterest upon my hubs discovering he didn’t buy sauce for his delicious ribs- we had everything in the pantry- and it turned out delicious! I’m sharing your recipe on my blog, please feel free to stop by. Of course, I’m giving you credit! I will definitely check it out! I am so glad you loved this, Samantha! Thank you! This is so delicious and I love that I actually do have all the ingredients on hand!! I also love the fact no preservatives. I was out of cayenne so I sprinkled with red pepper flakes..Thank-you so much for sharing <3 PS..It was thick enough for us without the corn starch! You can omit the cornstarch. No need for it. Hope you love this! I’d like to do a big batch, then put some up in mason jars. Will the heat sealing process of canning work with this recipe? HI Mike, I have never tried canning this so I am not sure. I would think it would work, but again, have not tried it. I’ve made other versions of BBQ before but your recipe has me intrigued. This last part of your ingredients list, can you please clarify the measurements: “1/8 tablespoon cold water mixed with 1 corn starch optional”. Did you mean 1/8 C (which is the same as 2 Tbs cold water)? 1 WHAT of the cornstarch…teaspoon, tablespoon, cup..what? I’ve read that most of those who posted here did not need to thicken the sauce. I’ve never had to thicken BBQ sauce before. Having said all that, in case this sauce needs thickening, what are the correct measurements for the cold water & cornstarch? It looks pretty good. I might try it with allspice and celery seed. Thanks for sharing. I made what I call a Bluegrass version. My family is from Kentucky. I used Kentucky Sorghum instead of molasses and I splashed in some Kentucky bourbon. It’s so good. I did not add cornstarch I just simmered it longer to thicken it up. It’s going on my meat in July for an amateur BBQ competition. It’ll be my first one. Ooo!! That sounds fun, and yummy! I hope it does well at the competition!! Good luck and thanks Josh! TWO items need to be cleared up. 1..The amount of cornstarch and water. The sauce does NOT need to be thickened. 2..Not one comment about using ONE CUP of brown sugar. For my taste, it is overly sweet. I would start with !/4 cup sugar and adjust from there. Otherwise, it IS a terrific sauce. There is not need for the cornstarch and yes, please do sweeten this to your taste. Let me know if you have other questions. Happy to help! 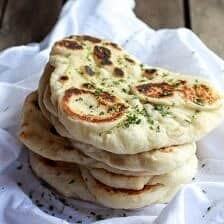 I tried this recipe at home, and I just loved it. I thought it was a little bit too sweet, so I added more vinegar. So glad you loved it Matthew! Thank you! 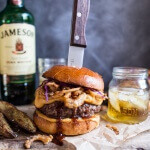 A GREAT recipe and the images you add in this post are amazing. Just made this recipe and its way to sweet. Next time I’m going to half the brown sugar . I am sorry this was too sweet for you, Sandra! I hope you enjoy it the next time you make this! I’m preparing to make spare ribs and definitely want to use a homemade sauce, so I can’t wait to try this! I saw a few reviews mentioning corn starch, but am I missing something because I don’t see it in the recipe? How can you state that you use good ingredients when you put worchestire sauce in the receipe? I used organic apple cider vinegar and had to substitute light brown sugar with extra molasses instead of dark brown sugar. To give it a kick, I substituted Chipotle for the Cayenne. Quite delicious. My husband said its taste is close to the real thing! I am so glad this turned out amazing for you! Thank you Tracy! I made this sauce and it is very good, but sweet baby rays has a smoke element that I’m not getting here. So next time I will add some hickory liquid smoke added some bourbon because well… bourbon lol! 5 stars thank you! Thank you so much Stephen! I am so glad you liked this recipe! I’ve made this sauce several times and it always turns out great. Just a quick question. If you were to put rum in it how much would you put in? I have made this recipe twice! Halved the brown sugar and used chipotle paste instead of cayenne pepper. We can’t get molasses in the uk so I used black treacle which I’m pretty sure is nearly the same thing. Everyone loves it (including one of my head chefs who is from Rome!) I think you have pretty much nailed this recipe, thank you so much!!! I am so happy to hear that you enjoyed this! Thank you Russ! I love the ingredients in your sauce. I plan on making the BBQ sauce the next time I grill. I’ve been looking for a sweet BBQ sauce and I’m confident I will like your recipe. Is it OK if I leave out the cayenne the first time or should I make two batches so that I can compare the two? Oh my this sauce is amazing. Wow. 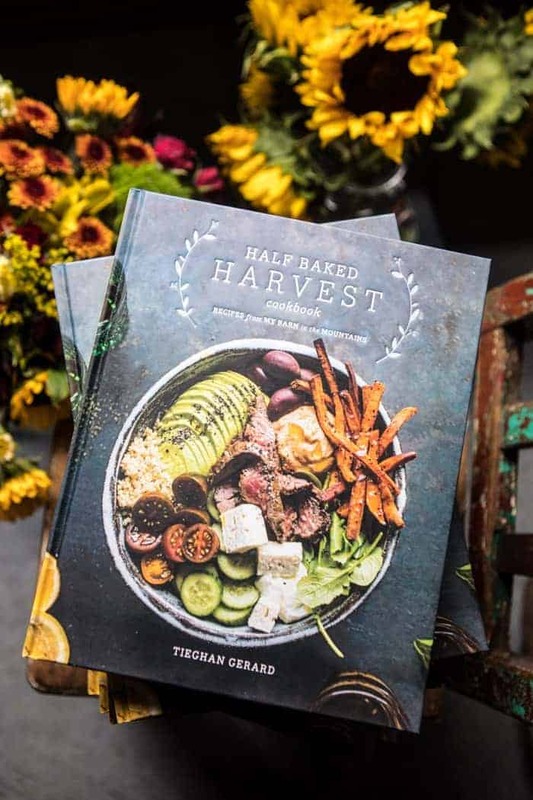 Great job with this recipe Tieghan. Thank you for sharing this. Made it with some fried chicken tenders that I also got from your site. I added a tbsp of ACV and it’s better than sweet baby rays! God bless you girl! So glad you think so!! Thank you Jenna! About to make my second batch of this. Yay! 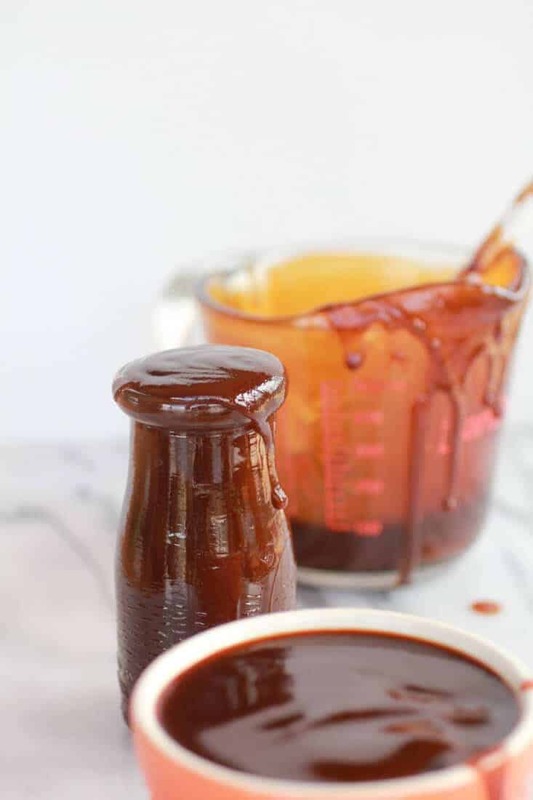 I finally found an amazing homemade BBQ sauce that everyone in my family loves! My husband almost likes no heat at all in his sauce and when he tasted this he was looking for things to put it on! Thank you Katie! I am so glad you like this recipe!! I am confused a number of comments mention it having corn startch in the it but I do not see it listed. It is just the ingredients listed at this time? 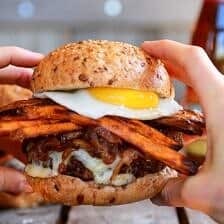 Made this recipe on a Keto eating plan. Used 8 doonks of pure Stevia instead of brown sugar and substituted 1/8 cup of cocoa for the molasses and Apple Cider Vinegar for the pineapple juice. I also cut down the cayenne pepper to about an 1/8 Tsp. Thank you Greg! I am really glad you enjoyed this recipe! Too sweet . Would cut back on the brown sugar or molasses next time. Hi Jen! I am sorry to hear that! I hope you enjoy this more the next time you make it! I think you should revise your calorie count a tad or change it from “per serving” to “per jar or batch”. No way it is over 500 calories per serving. Any others I have checked are 60 calories per 2 TBS serving. I keep a jar of this in my refrigerator all the time. I love to use BBQ and loved Sweet Baby Ray’s. This is even better!!! I made BBQ chicken stuffed sweet potatoes for dinner tonight using this sauce. WOW!! Delicious!! Thank you for posting this recipe!! Thank you so much Pat! I will work on that! I am so glad you loved this recipe! How long does it last in a mason jar ?? Does it have to be refrigerated ??? Hi Mary! I do not add corn syrup just brown sugar and molasses! I hope you love this! I have not tried that, but I am sure it would be great. Let me know how it goes. Enjoy! to select keywords to make use of on the site that there is a probability of ranking for. In some comments I see corn starch mentioned. The recipe I am reading has no corn starch as an ingredient. Has it been revised since it was originally posted? Any suggestions as to why when it cools, the sugar gets grainy again? When it was simmering the sugar was totally dissolved. I used Sukrin Gold. Hey Dawn, I really have no idea. I have never had that happen. My guess is the sugar you are using. Because it is a sugar replacer and not real sugar my guess is something weird is happening. Yum! We are a SBR family & everyone loved this! Thank you! I am so happy to hear that Lynda! Thank you! How long can I leave the sauce for before going bad? I made this with cherry juice rather than pineapple or avc cut back a bit on the smoked paprika because I really don’t like it used a little more than a teaspoon and a half a teaspoon of cayenne. It’s delicious and it doesn’t taste like bottled store bought sauce to me and that’s fine the only store bought one I like is big johns ok west bbq and dipping sauce. I didn’t catch it was a sweet baby rays copy cat until after I made it. My boyfriend just saw the picture and said I want to try that one. Anyway I will make this again and next time I will increase the cayenne a bit I can’t sense any heat but we eat a ton of spicy food. Thank you for the recipe. Hi Eva! I am so glad you enjoyed this recipe! Thank you so much! =-=It is 2019 now. No comments in a looooong time. I have one change in this recipe. Forget the salt. I WANT YOU TO TRY THIS, This should and will make this top shelf. MY secret to the perfect sauce. I want you to go to the store and pick up a tiny can of ANCHOVIES. That is those tiny fish’es which are salty anyway but gives that special touch to any bbq sauce recipes that require salt. ONLY USE 3 ANCHOVIES THEN PUT ALL INGREDIENTS IN A BLENDER. There you have ONE of my secrets. The second secret is to add this truly exotic ingredient…………..TAMARIND PASTE…..2 TBLS Most likely will have to order it as I did…2 little tubs, $5 ea. Hi Ed! I am so glad you like this and you add in your own little touch! I would love to try your version, thank you for sharing it with me! 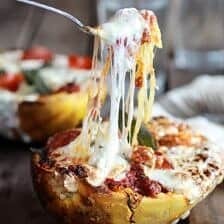 Hello, interested in making this recipe. How much does this recipe make? 2 cups, 4 cups etc…look forward to trying it!!! I have a question about the ground mustard in the homemade barbecue sauce. Is ground mustard the powdered mustard, if not what kind of mustard should I use.